Biologically Active Cannabinoids from High-Potency Cannabis sativa. Marijuana (Cannabis sativa) has long been known to contain antibacterial cannabinoids, whose potential to address antibiotic resistance has not yet been investigated. All five major cannabinoids (cannabidiol (1b), cannabichromene (2), cannabigerol (3b), Δ9-tetrahydrocannabinol (4b), and cannabinol (5)) showed potent activity against a variety of methicillin-resistant Staphylococcus aureus (MRSA) strains of current clinical relevance. Activity was remarkably tolerant to the nature of the prenyl moiety, to its relative position compared to the n-pentyl moiety (abnormal cannabinoids), and to carboxylation of the resorcinyl moiety (pre-cannabinoids). Conversely, methylation and acetylation of the phenolic hydroxyls, esterification of the carboxylic group of pre-cannabinoids, and introduction of a second prenyl moiety were all detrimental for antibacterial activity. 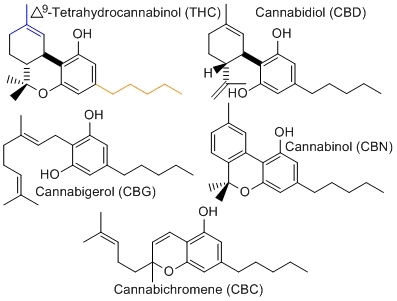 Taken together, these observations suggest that the prenyl moiety of cannabinoids serves mainly as a modulator of lipid affinity for the olivetol core, a per se poorly active antibacterial pharmacophore, while their high potency definitely suggests a specific, but yet elusive, mechanism of activity.